How to Make Crispy Fries? 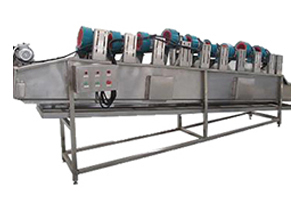 Automatic Potato Chips Making Machine is suitable for a potato chips industry manufacture. Full automatic operation ensures the final potato chips French fries of a constant taste and quality. Potato chips show no sign of declining in popularity till today. The increasing young population, globally, disposable incomes and changing lifestyles are promoting higher consumption of potato chips. These chips are served as appetizers, side dish, or as snacks. Innovation or new product offering is considered as an opportunity for this market. 01 Potato visual inspection When the potatoes arrive at the plant, the potatoes are examined for green edges andblemishes. through the sewage exit while conveyers. However, potatoes need to be manual put into this water sink. Potato peeler machine ensures optimum peeling. The less peel is removed, the higher the yield of your process. • Using brush rolls to finish the peeling of potato and separate shower for washing while screw blade carries potatoes forward. • Small damage and more cleaning. • Big capacity is suitable for industrial application. 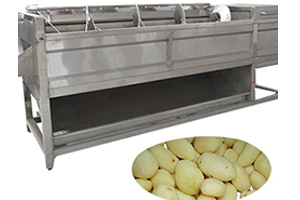 After potato peeling process, hand picking will be done on a sorting table to select the defective potatoes. And then up-to-standard potatoes will be conveyer to next process, chips or fries cutting and slicing. How to cut potatoes for French fries? How to cut waffle fries? How to make potato crisps? 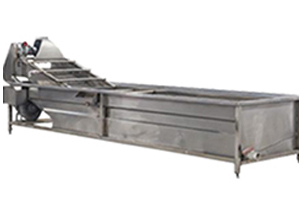 In this process, Potato chips slicing machine will cut the peeled potatoes into slices, chips, sticks, strips and shredded potatoes easily. the potatoes are cut. 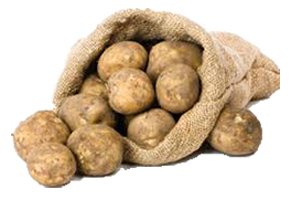 Some manufacturers, who market their chips as natural, do not wash the starch off the potatoes. Sometimes, chips blanching process means color treatment. 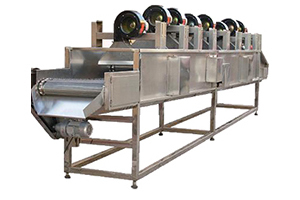 An accurate blanching time and correct temperature setting is the key for this process. Potato Chips blanching machine has water temperature automatically controlled and blanching time adjustable freely. After blanching process, potato chips or fries will have superior flavor, texture and color while active enzyme is restrained for easy reservation. Potato chips cooling machine is the same to the chips washer. Before the chips or fries are fried, it should be properly dried. 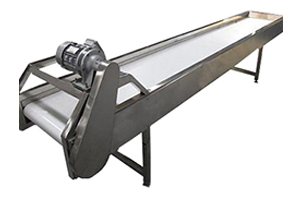 This will raise the quality of the end result of the frying process, which results in a crispier. 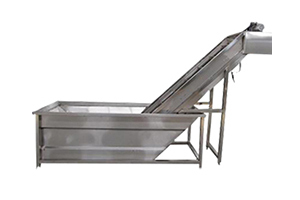 Potato chips air drying machine conveyer chips or fries with air blowing while chips turnover, the surface water will be removed completely and quickly, it is helpful for the frying process, not only saving frying time, but also having a crispier production. How to make potato crisps? How to make fries? In this process, fresh potato chips and fries will be fried with a continuously chips fries fryer. • Continuously working, full automatic control, there is no any worry. • Potato chips French fries has bright color, good taste and improving product quality. 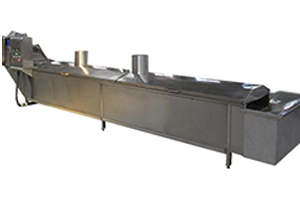 • Frying time in accordance with different recipe is easy to set up and automatic control during chips and fries frying process. Potato chips and French fires are crisper and tasty after de-oiling process, also too much fat has no benefits to health. 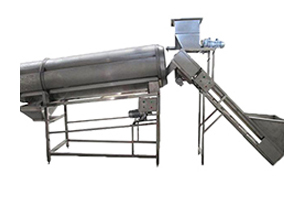 Chips De-fatting machine is similar to Potato chips air dehydration machine, a wire mesh belt pulls out the hot chips. As the chips move along the mesh conveyer belt, excess oil is drained off with a jet air blowing process and the chips begin to cool. They then move under an optical sorter that picks out any burnt slices and removes. 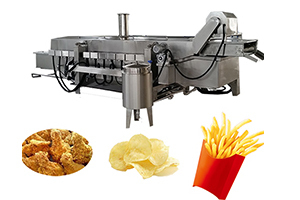 Potato chips that are to be flavoured pass through a drum potato chips fries flavoring machine which is filled with the desired powdered seasonings. 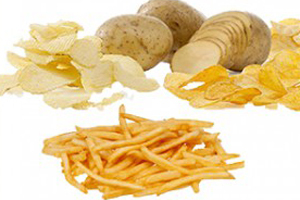 to meet different customer demand for potato chips, hot chips, finger chips, fries, frites, potato wedges. 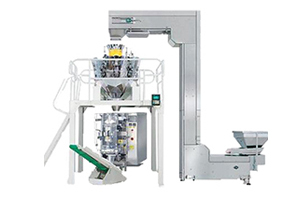 The chips are conveyed to a chips automatic packaging machine with a scale. As the pre-set weight of chips is measured, a metal detector checks the chips once more for any foreign matter such as metal pieces that could have come with the potatoes or been picked up in the frying process.